A coaxial-cable trap dipole antenna installed in the attic provides a surprisingly effective solution to HF operation on the 10, 15, 20, 30, 40, and 80 meter amateur bands at a QTH with restrictive covenants that prohibit outside antennas. When we purchased our first home in 1980 amateur radio antenna siting was a top selection criteria. But when a job change in 1995 required relocation, my XYL announced that it was "her turn" to choose our new QTH, and amateur radio was not on her priority list! She chose a beautiful new home in a development with excellent amenities for raising our family, but it came with restrictive covenants that prohibit any outside antenna other than a "small antenna for television reception." I feared my HF operating days might be over. My early HF operating attempts at the new QTH were not encouraging. The landscaping on our new lot consisted of ornamental trees and shrubs that were barely taller than myself. I tried a full wave horizontal loop of nearly invisible small gauge wire which circled the house hanging below the aluminum gutters, but its performance was disappointing and it caused severe RFI problems, forcing me to limit operation to QRP power levels. I next tried an inverted vee using the same stealthy wire, with the peak supported by the house and the ends supported by ornamental shrubs at corners of the lot. It performed as a classic "cloud warmer" that worked for local contacts but it was a lousy DX antenna. And the low height of the shrubs that served as end supports made mowing the lawn look like I was practicing for a limbo contest! height - the roof ridge on our 2-story home is almost 30' above ground level. This is several times higher than any other object on our property, and is high enough (minimum 1/2 wavelength height) for a horizontal dipole to have a reasonably low angle of radiation on the 10, 15, and 20 meter bands. stealth - any antenna in the attic would be completely hidden, so it would not violate the restrictive covenants. freedom from environment - an outside antenna must withstand the abuse of wind, moisture, ice, UV, birds, squirrels, etc., but the attic provides protection from all these failure mechanisms. simple construction - without environmental stresses to worry about, antenna mechanical and electrical construction is greatly simplified! ease of erection and modification - as long as one is careful not to fall through the ceiling, the attic provides easy access to the antenna in almost any weather. However, summer work in an attic is best performed on overcast days, at night, or in the early morning hours. RFI - an attic antenna may interfere with household electrical and electronic systems due to its proximity. interactions with nearby objects - electrical wiring, plumbing, ductwork, and other construction materials may adversely interact with an attic antenna. reduced bandwidth - if a shortened length antenna is chosen to accommodate the space limitations of an attic installation, it can reduce the SWR bandwidth. RF exposure - because of the proximity to residents of the house, be sure to conduct an RF safety evaluation. fire safety - be certain your antenna design and construction are appropriate for the power level you intend to use. You don't want a trap or end insulator to catch fire in your attic! Both my experience and the amateur literature suggest that the antenna described here should safely accept 100 W if carefully constructed and installed. Our attic consists of 2x4 wood truss construction. The ridge of the main span is approximately 44 feet long with a non-metallic ridge vent. The roofing material is asphalt composition shingles. The siding and soffits are vinyl. The roof is a 12" pitch (i.e. a 45 degree angle) which results in a tall ridge height. The plumbing vent stacks are PVC plastic. The only significant metal objects in the attic are various runs of electrical wiring that service the 5 smoke detectors and 3 ceiling fans installed in the second floor ceiling, and two lengths of flexible ductwork. As attics go, I consider ours is very amenable to the presence of an amateur HF antenna. After consideration of the alternatives, I chose to construct a trap dipole antenna in my attic using coaxial-cable traps. I desired multiband capability, and selected a single trap dipole over parallel dipoles or a hybrid design consisting of 2 or more trap dipoles in parallel. Parallel dipoles are more difficult to tune due to interactions between the elements. Also, antenna traps function as loading coils below their resonant frequency and result in a shortened antenna: by using a single dipole design with multiple traps I was able to fit 40 meter coverage comfortably along the 44 foot main ridge of my attic roof. I included 80 meter coverage by adding a pair of 40 meters traps and making a right angle bend at each end of the attic, continuing the 80 meter segments down a few inches below and parallel to the slope of the roof. Since most of the current, and hence most of the radiation, comes from the central portion of a half-wave dipole, this is a reasonable compromise. Non-resonant antennas present high SWR which results in large losses when coaxial cable feedline is used. These losses can be reduced to an acceptable level by using open wire feedline. However, it would be very difficult to route open wire feedline between my operating location and the attic, so I wanted to use a coaxial cable feedline. Non-resonant antennas can produce a complex radiation pattern with sharp peaks and nulls, e.g. when operating at 10, 15, or 20 meters on an antenna that is an electrical half wavelength on 80 meters. The resonant antenna I constructed produces the characteristic radiation pattern of a half wave dipole on every band, so one need not worry about missing a contact because the other station happens to lie in a null of a complex antenna pattern. Non-resonant antennas require tuning when changing bands. The series trap dipole construction results in a significantly shortened antenna vs. a non-resonant wire dipole. This is a significant attribute because of space limitations in typical attics. 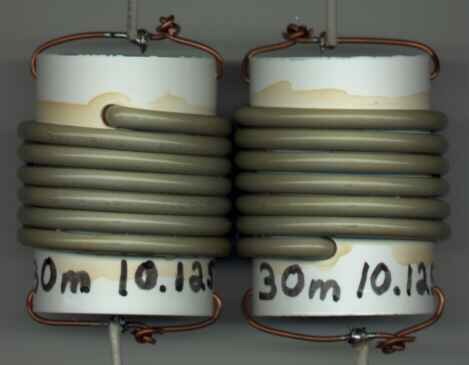 Adding loading coils to a non-resonant wire dipole could achieve a similar result, however. The clever use of coaxial-cable to construct antenna traps was first described in the amateur literature by Johns in 1981. Coaxial-cable traps are inexpensive, easy to construct, stable with respect to temperature variation and capable of operation at surprisingly high power levels. [2,3] The traps used in this antenna are based on the "optimized" design graphs derived by Sommer. Coaxial-cable antenna traps are constructed by winding coaxial-cable on a circular form. The center conductor of one end is soldered to the shield of the other end, and the remaining center conductor and shield connections are connected to the antenna elements. The series-connected inner conductor and shield of the coiled coaxial-cable act like a bifilar or parallel-turns winding, forming the trap inductor, while the same inner conductor and shield, separated by the coaxial-cable dielectric, serve as the trap capacitor. The resultant parallel-resonant LC circuit exhibits a high impedance at the resonant frequency of the trap and effectively disconnects everything after the trap from the antenna. Any inner traps (which are operating below their resonant frequency) function as loading coils and shorten the overall physical length of the antenna. I constructed my traps using good quality RG-58/U coax scavenged from a discarded 10BASE-2 Ethernet cable. PVC couplings were used for the trap forms: PVC couplings are very inexpensive, readily available in useful diameters, and can be purchased individually, whereas PVC pipe is usually sold only in 10 foot lengths. 14 gauge solid wire was used to form "bridle wires" for electrical termination of the coax and electrical and mechanical termination of the antenna wire elements. The coaxial cable length specified is the active length in which the shield is intact. The overall length of coaxial cable required, including the prepared ends, will be approximately 2-3 inches longer. The outside diameter of the trap form is a critical dimension. I used Schedule 40 PVC couplings as trap forms (NOT Schedule 40 PVC pipe!) Note in Table 1 that the nominal size of the PVC couplings represents the PVC pipe size the coupling is designed to join, which is significantly smaller than the outside diameter of the coupling. Coaxial-cable traps have a relatively high Q, which results in a relatively sharp frequency resonance. You must adjust (i.e. tune) the traps or the antenna will not work properly, as traps can't do their job if they don't resonate (i.e. become a high impedance) at the correct frequency. If you don't have a dip meter, you can use an HF antenna analyzer, such as those made by Autek or MFJ, to adjust the trap resonant frequency using the procedure in the section titled TRAP FREQUENCY MEASUREMENT athttp://www.autekresearch.com/uses.htm. With either a dip meter or antenna analyzer you will get the most accurate result by using the minimum coupling between the trap and the measuring instrument which produces a discernable dip. 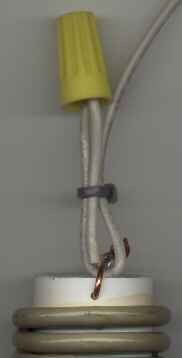 Unlike traps made from a discrete inductor and capacitor, coaxial-cable traps at resonance, i.e. in their high impedance state, exhibit a different amount of end loading depending on which end faces the center of the antenna. Either orientation works, but to maintain dipole symmetry trap pairs should always be installed symmetrically. I use the easy to remember rule, "Connect center conductor of trap coax toward center of antenna." The 10 and 15 meter traps, wound on 3/4" PVC pipe couplings. The 20 meter traps, wound on 1" PVC pipe couplings. The 30 meter traps, wound on 1.25" PVC pipe couplings. The 40 meter traps, wound on 1.5" PVC pipe couplings. I used this simple method to connect the traps to the antenna wire elements. 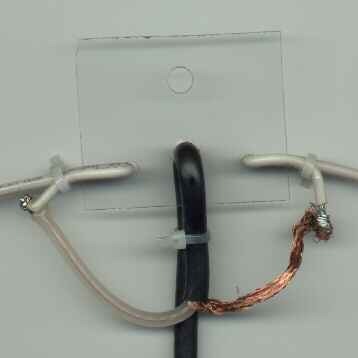 I soldered a short (approximately 2") wire pigtail to the bridle wire on each end of the trap. Then the antenna wire was looped through the trap bridle wire and secured to the pigtail using an electrical wire nut. This made trimming the lengths of the antenna elements easy, as the connections could be readily disassembled and no soldering in the attic was required. When the antenna trimming was complete I used a nylon cable tie to secure the antenna wire loop to the pigtail to strain relieve the connection. I used 14 gauge stranded household electrical wire for the antenna elements. This wire is very inexpensive when purchased in 500 foot spool quantities at home centers. The insulated jacket causes the wire to have a velocity factor somewhat lower than that of bare copper wire. This is a beneficial attribute for an antenna intended for limited space use such as in an attic, as it results in a shorter overall length. The antenna center insulator was constructed from a piece of scrap Plexiglas® stock[*]. The center of a half-wave dipole is a current feed point so just about any insulating material will work here. Plastic cable ties are used to secure the antenna elements and the RG-58/U feedline to the insulator. A rope attached to the topmost hole is used to support the antenna center. The rope is approximately twice the height of the attic. It passes through a screw eye secured at the peak of the attic which functions like a pulley, allowing the antenna center to be easily raised and lowered. I used "real" pulleys at the ends of the attic where the 80 meter segments were bent 90 degrees to fit within the available space. The insulated 14 gauge wire rolls easily over the "real" pulleys, allowing the antenna to be easily lowered for adjustment. I supported the pulleys from the top of the attic walls with a length of plastic rope, which also serves as an insulator. The antenna end insulators (not illustrated) must withstand high voltage in operation, so a bit of care must be taken with their design to insure that you don't start a fire in your attic! I fashioned mine by drilling holes at the ends of lengths of scrap plastic rod stock. A generous length of rope was attached to each end insulator, and screw eyes were used as pulleys to allow the antenna to be easily raised and lowered. [*] The original sheet of Plexiglas® was purchased to replace a pane in the shack window so that holes could be easily drilled for the purpose of bringing cables into the shack. When I move from this QTH I can replace the original glass pane, leaving no trace of my antenna installation. I constructed a choke balun near the antenna center insulator by wrapping approximately 6 feet of the antenna coaxial-cable feedline as a single layer winding on a scrap polyethylene food container that was approximately 4 inches diameter. I used cable ties through small holes drilled in the container to secure the coax winding. Some amateurs argue that a balun is not necessary when feeding a dipole with coax, but the proximity of this antenna to other objects and the physical constraints of attic installation make antenna symmetry unlikely in this situation. The simple choke balun used here is trivial to construct, and I do not feel it is worth the risk of feedline radiation problems to omit it. The final dimensions of my antenna are shown below. If you try to duplicate this antenna you should start with longer lengths and then trim as necessary, as the lengths will be affected somewhat by height above ground, and in an attic installation by proximity to the building. An antenna analyzer, such as the MFJ-259 that I used, greatly speeds the trimming process. If you are not interested in the 30 meter WARC band, here are the dimensions of the antenna without the 30 meter traps. You may note that the 80 meter end sections are significantly longer in the version without the 30 meter traps: much of that difference may be due to the larger percentage of the 80 meter section length that had to be bent to fit my attic in that version. One of the most often quoted disadvantages of trap antennas is reduced bandwidth. But the useful bandwidth of the coaxial trap dipole described here is sufficient for no-tuner use over much of the 6 bands. As the measurements in Table 2 illustrate, the antenna performs with better than 2:1 SWR over the entire 10 and 15 meter amateur bands. Almost all of 20 meters is usable with less than a 3:1 SWR. The 40 and 80 meter bands were trimmed for operation within the CW band segment. Table 3 contains the resonant frequencies and SWR, 2:1 SWR limits, and 3:1 SWR limits of the antenna as measured after the final trimming of each of the elements. I finished installing this antenna on a Saturday. The next morning I connected my Heathkit HW-8 QRP rig and answered the first CQ I heard, which was an SM5 (Sweden) station on 15 meters. He responded to my call and we had a nice QSO, with solid copy on every exchange. I was running 2 watts output. I've had similar results on the other bands as well. The performance of this attic coaxial-cable trap dipole doesn't compare to the 10-15-20 meter Yagi and 45 foot tower I enjoyed at my former QTH, but it continues to surprise me with just how well it does work. I have found the SWR bandwidth adequate for no-tune operation with my transceiver across the entire 10, 15, 20, and 30 meter bands, and the CW segment of 40 and 80 meters. I experienced no RFI problems at QRP power levels, but I did experience serious RFI problems with our stereo receiver at QRO (100 Watt) output power on 40 meters that I remediated by wrapping its power and surround speaker cables around split core "snap on" filter chokes (Radio Shack 273-104). Although many hams succeed with attic antennas, I know several who have tried attic dipoles and were disappointed with their performance. Perhaps my attic is more "antenna friendly" than theirs, or perhaps other factors conspired against them. I do hope that this story will inspire others with restrictive covenants (or restrictive spouses!) to not give up. This antenna has made it possible for me to operate a satisfying HF station in spite of the restrictive covenants imposed on my dwelling. Good luck, and I hope to hear you on the air soon! R. H. Johns, "Coaxial Cable Antenna Traps," QST, May 1981, pp. 15-17. G. E. O'Neil, "Trapping the Mysteries of Trap Antennas," Ham Radio, Oct 1981, pp 10-16. D. DeMaw, "Lightweight Trap Antennas -- Some Thoughts," QST, June 1983, pp. 15-18. R. Sommer, "Optimizing Coaxial-Cable Traps," QST, Dec 1984, pp. 37-42. J. Grebenkemper, "Multiband Trap and Parallel HF Dipoles -- A Comparison," QST, May 1985, pp. 26-31. D. Kennedy, "Coaxial-Cable Traps", QST, August, 1985, p. 43. M. Logan, "Coaxial-Cable Traps", QST, August, 1985, p. 43. Can one add the 12 and 17 meter WARC bands? See Appendix - Why Aren't 12 and 17 Meters Supported? below. Can 80 meters be deleted? Can 80 meters and 40 meters be deleted? Yes. 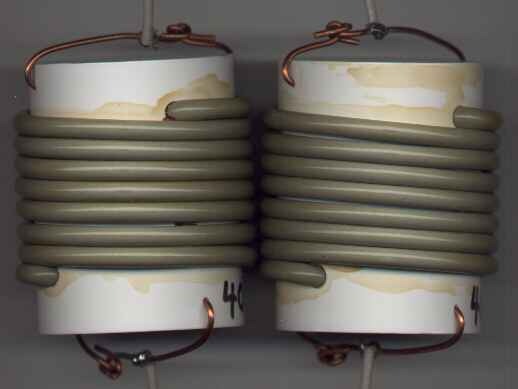 Remember that antenna traps become a high impedance at their resonant frequency, so the trap essentially becomes an insulator at resonance and everything after the trap is disconnected from the antenna. To delete 80 meters, simply omit the 40 meter traps and everything after them, placing the end insulators where the 40 meter traps used to be, and you'll have a 10/15/20/30/40 antenna. The dimensions of the remainder of the antenna will be unaffected except that the 40 meter segment lengths might need to be lengthened slightly due to the removal of the end loading provided by the 40 meter traps. Similarly, to delete both 80 and 40 meters simply omit the 30 meter traps and everything after them, placing the end insulators where the 30 meter traps used to be, and you'll have a 10/15/20/30 antenna. The dimensions of the remainder of the antenna will be unaffected except that the 30 meter segment lengths might need to be lengthened slightly due to the removal of the end loading provided by the 30 meter traps. Can this antenna be installed outdoors? If you are in a region where ice or wind loading are likely you may also want to improve the mechanical strength, e.g. 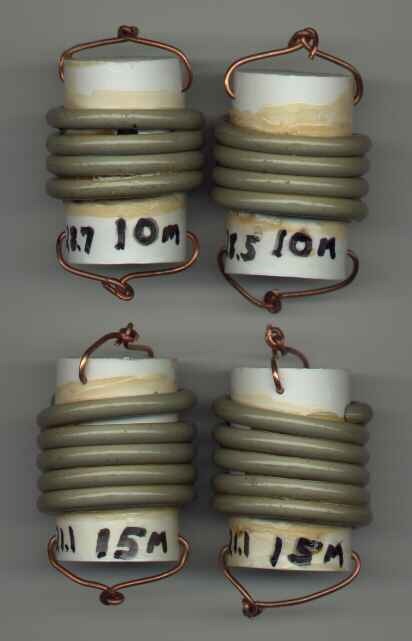 use more substantial center and end insulators. Can this antenna be used in a vertical orientation? "Not really having a good spot to hide a horizontal dipole for hf, vertically up in the tree works great. SWR is very reasonable, way under 2:1 where I stray. It's so nice to have 3 bands and no tuner on one antenna. I did have a single delta loop in the tree tuned for 10m, but after the tree trimming, it became too noticable." Can this antenna be used in an "inverted vee" orientation? "Not being one to sit still for long, I stared at my tree outback long enough to visualize I can mount the CTD [coaxial-cable trap dipole] horizontally, inverted vee style, and have it still "hidden" to the untrained eye. You know what, John, it works even better. I've been copying Europe, Asia, NA, SA, and Africa with this setup. I run the NCDXF beacon tracking program, and can hear the ZS6 beacon pretty much every day, on 20, 15, & 10m. Yes, the other QTH's come in too, but ZS6 being on the complete opposite side of the earth from KH6 makes it extra special. So you can imagine, hamming has been a lot of fun the last couple of months. Yes, the CTD does work vertically, but horizontally seems to work better, by the lobe of my ear, anyway. SWR is a tad higher on all 3 bands, but from what I've been hearing, it doesn't seem to affect performance." Why are the traps resonant at the center rather than at or below the lower edge of the band of interest, as in some other trap antenna designs? Modeling suggests that a fractional dB increase in gain is possible with a lower resonant trap frequency (e.g. see the discussion The Effect of Trap Resonant Frequency on Performance in http://www.cebik.com/trapg.html.) Unfortunately, this practice reduces the isolation provided by a trap at resonance which can make pruning the elements more difficult. It also raises the feedpoint impedance. I believe these disadvantages outweigh the insignificant theoretical improvement in antenna gain. Appendix - Why Aren't 12 and 17 Meters Supported? I did not include 12 and 17 meters in the series trap dipole described above because the loading effect of the 10 meter traps when operating on 12 meters would require the length of the 12 meter elements to be negative in order to achieve resonance. Similarly, the loading of the 15 meter traps when operating on 17 meters would require negative length 17 meter elements. 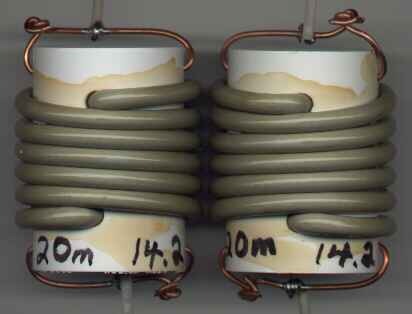 If operation on the 12 and 17 meter WARC bands is desired, one could construct a second trap dipole for those two bands using a pair of traps resonant at 12 meters. The inner elements (approximately 112 inches each) would form a full size half wavelength 12 meter dipole. The length of the outer (17 meter band) elements would be reduced by the loading effect of the 12 meter traps. In Table 4 below I include the dimensions of 12 meter traps that could be used in the construction of such an antenna. Table 4 also includes dimensions for 17 meter traps. These would not be used for a 12/17 meter dipole, but are included for completeness in case one is interested in constructing another band combination, e.g. a trap dipole covering the 12/17/30 meter WARC bands which would require a pair of 12 meter traps and a pair of 17 meter traps. A 12/17 meter dipole could be fed with a second feedline or alternatively, it could be connected in parallel with the 10/15/20/30/40/80 dipole described in the main section of this paper. I have not tried or modeled the parallel connection so I do not know what interaction, if any, would occur between the two antennas.